165 years ago, gold was discovered in the western foothills of the Sierras. Within a few frenzied years, miners had scoured every square inch of those foothills in pursuit of their precious metal. In the wake of their fevered exploration, they left a wonderfully tangled web of tiny roads connecting tiny towns. No other region in California presents the cyclist with such a complex and confusing network of interesting little back roads. From a cyclist’s point of view, it’s an embarrassment of riches. As a tour planner, confronted with so many choices, I felt like a kid in a candy shop: what to include; what to leave out. Fortunately, I had the advice and assistance of many experienced riders from the local bike clubs in Sacramento and Stockton. Their extensive local knowledge helped me sort through a bewildering number of options. The result is a package of back road loops that ranks among the best we have ever devised. 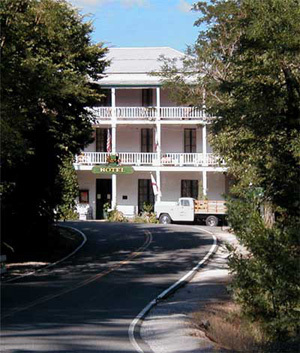 Centered in the little town of Volcano, it meanders through the remote mountains and foothills via loop routes that always return to the same location: the venerable St. George Hotel (photo). The routes will visit many points of historical interest in this region famous for the Gold Rush: rough-and-tumble boom towns that sprang up and prospered at the height of gold fever, and then went into suspended animation after the fever had passed. In between the pioneer towns are miles of quiet little roads through the hills that will have riders climbing or descending most of the time, sometimes over steep, wooded ridges, sometimes out across open, rolling grasslands, and sometimes down into canyons where some of California’s last, best wild rivers still run free. This mini-tour shares routes and roads with both the Gold Country and Mother Lode one-week tours. Some stages are nearly identical, while others mix the roads up in new combinations so that the stages seem entirely fresh. This is, overall, a very hilly tour. Not every mile is brutal, but some are, and many are at least challenging. The net result is a four-day package that will test most riders. You will need to be comfortable with climbing and descending to enjoy this tour. Climbs into the hills to the north and east of Volcano—up to an elevation of 5000’—exploring the quaint little village of Fiddletown, as well as miles of tiny roads through the middle of nowhere. Offers some challenging climbs and several absolutely incredible descents, including almost all of the final 15 miles of the ride. Probably the toughest of the four stages. Climbs to Pine Grove, then descends for ten miles to the outskirts of Jackson. Passes through the Gold Rush pioneer town of Mokelumne Hill before setting off for parts unknown: Jesus Maria canyon and numerous descents into and climbs out of the various canyons of the forks of the Mokelumne and Calaveras Rivers. Contains many steep climbs, but also many great downhills and spectacular wilderness scenery. The easiest stage of the tour, and can be made easier with specific shortcuts. Visits the charming towns of Sutter Creek and tiny Drytown. More time out in the rolling, grasslands to the west of the mountains than up in the mountains today. Only a couple of challenging climbs, and they’re short. Includes some wonderful miles on very obscure little lanes that you would be extremely unlikely to find on your own. Moderately difficult. Heads out of the mountains and down into the grass-covered foothills again, this time circling Pardee Reservoir. Explores in more detail the pioneer downtown of Jackson (which we just missed on the Southeast Loop).